While some books present “ideal” ethnographic field methods, Inside Ethnography shares the reality of fieldwork in action. With a focus on strategies employed with populations at society’s margins, twenty-one contemporary ethnographers examine their cutting-edge studies with honesty and introspection, drawing readers into the field to visualize the challenges they’ve faced. Representing disciplinary approaches from criminology, sociology, anthropology, public health, business, and social work, and explicitly designed for courses on ethnographic and qualitative methods, crime, deviance, drugs, and urban sociology, the authors portray an evolving methodology that adapts to the conditions of the field while tackling emerging controversies with perceptive sensitivity. Their judicious advice on how to avoid pitfalls and remedy missteps provides unusual insights for practitioners, academics, and undergraduate and graduate students. 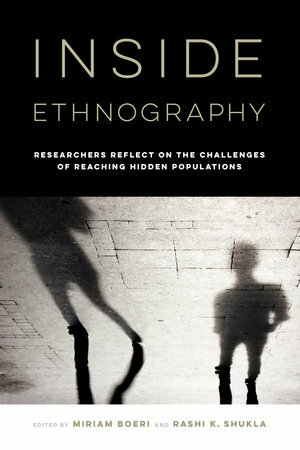 Inside Ethnography better prepares future ethnographers, adds to the skills of practiced ethnographers, and animates the standard methodological how-to with candid accounts of moral dilemmas and hard-learned lessons from leading ethnographers around the world. Miriam Boeri is Associate Professor of Sociology at Bentley University. She is the author of Hurt: Chronicles of the Drug War Generation and Women on Ice: Methamphetamine Use among Suburban Women. Rashi K. Shukla is Professor of Criminal Justice at the University of Central Oklahoma. She is the author of Methamphetamine: A Love Story.